Order your child T-Shirt. NOW!! 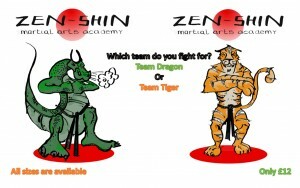 Zen-Shin Academy Summer Karate TIGER and DRAGON T-Shirt Comfortable, casual and loose fitting,t-shirt will quickly become one of they favourites the kids love them.